Going Going Gone! Roar! This Canadian Artist's work does not stay available for a New York minute. Anna is one of LES FAUVES, an ever growing collection of one of a kind creatures made from recycled wool sweaters. Each of them are stuffed with wool fleece and have a semi-precious stone in their chest. All of LES FAUVES are suitable for children of all ages, however the smaller accessories should not be given to children who might swallow them. Anna is a beautiful kermode or spirit bear. She is happiest in nature, observing and drawing. 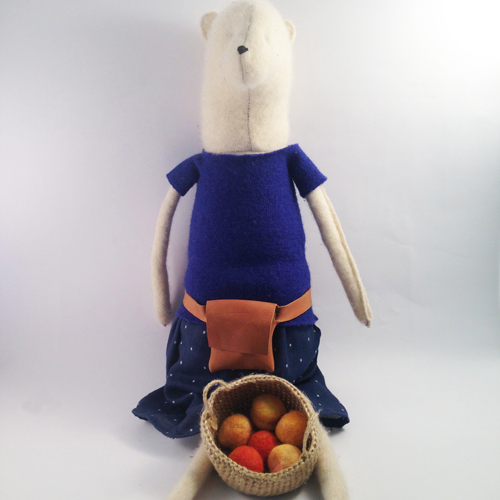 She comes with a basket full of felted oranges and peaches, a second outfit, a leather fanny pack with a sketchbook and a portrait. 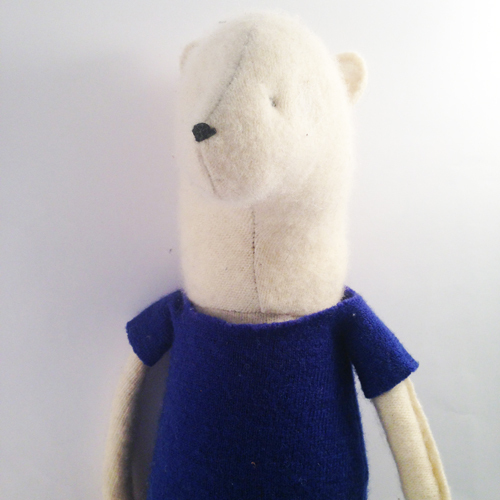 She measures 19" tall and is made of upcycled cashmere.